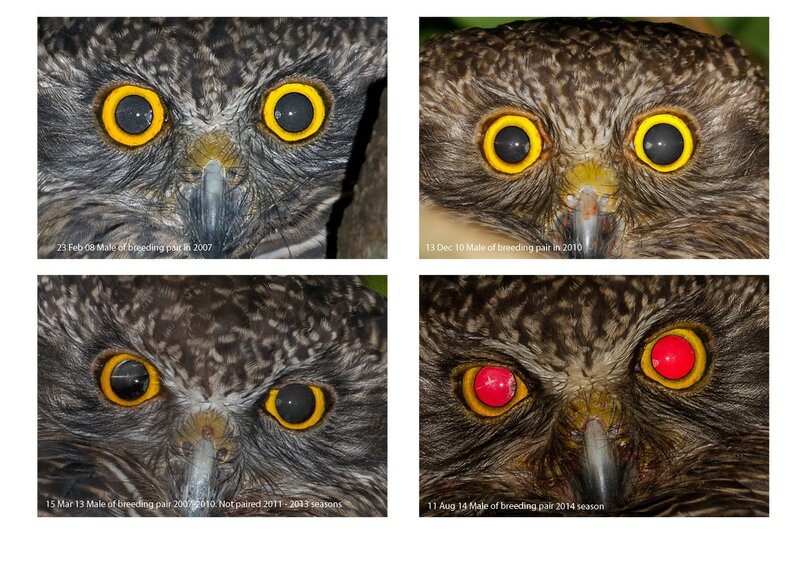 ​Some Powerful Owls have characteristic artefacts revealed in their eyes by flash photography. To see the artefact the flash needs to be close to the camera axis to give a strong ‘red-eye’ effect & the owl needs have its eyes fairly wide open. The following photo series taken over 7 years follows a male that first bred in Bluegum in 2007 & disappeared in early 2015. He has artefacts in both eyes. In correspondence with Prof. Jack Pettigrew, Queensland Brain Institute, he has indicated that he considers these artefacts to be cataracts & suspects that they are caused by poor nutrition at some point in the owl’s development. He has seen lesions like this in his hand-raised Boobook & attributes it to it being fed solely on meat strips by its original finder before being given whole mice after being given into Jack’s care. Jack indicated that he considered the nutritional complement of the whole prey animal, including the viscera, may provide trace elements that might protect eyes from developing cataracts. With Powerful Owls the parent birds stop feeding their young around February, forcing it to hunt for itself. This is a lean period for a young owl with less developed hunting skills & an easier target for Ravens & Currawongs to generally harass & steal prey the young owl has already caught. The first 3 photos have been ‘red-eye fixed’ by reducing the saturation of the red channel & darkening it. ​Note that this artefact rotates with the eye as the head is swivelled or tilted. This, & the repeatability of observations on different days, locations, night or daylight, rule out general reflections. Note that the eye artefact is not seen in natural light or in ‘off-camera’ flash or natural light conditions. The bird shown has the most obvious artefacts that I have seen but quite a few Powerful Owls, & one of the local Boobooks, have such artefacts that allow reliable identification of individuals, albeit once the photo is onscreen & compared to the database. The eyelid characteristic creasing adds further to the confidence of ID of these individuals. A difficulty with the method is that in not all photos taken from the same spot of the same bird will show the artefacts due to subtle angular changes of the eyes so the absence of artefacts does not rule out a particular individual. ​Following are the eye details of the breeding pair in 2014. The male is the same bird as shown above that bred in Bluegum 2007, 08, 09, & 10. He bred again in 2014 with a new mate. 2014 was the last time he bred (at Bluegum anyway). His mate bred with a new male 2015 & 2016. ​The following eye details are the breeding pair of 2016. 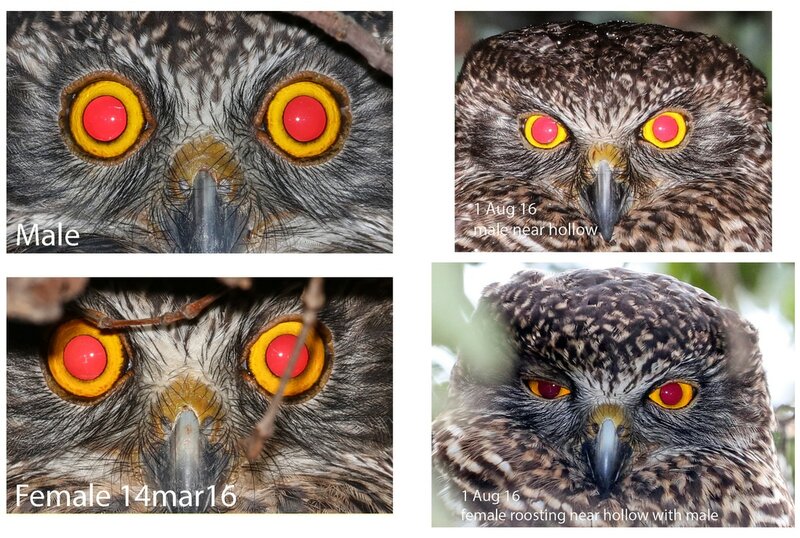 A photo of each taken on 16 March 2016 prior to nesting & roosting close together, & photos of each taken 1st August 2016 about 15 metres from the hollow is shown.
. ​While the male has a less obvious horizontal artefact at 2 o’clock in the right eye which makes ID more difficult, it is obviously not the same male as 2014. The female in both 2014 & 2016 is the same bird & has the vertical artefact at 6 o’clock in the right eye that is repeated in many photos taken 2014, 15, 16 & 2017. I dont know the fate of the lost partners, whether they were driven out by a competior, deserted or died. From my observations & hundreds of photos, I believe a previously breeding bird has bred with a new partner in 2013 & 2015 seasons in Bluegum.